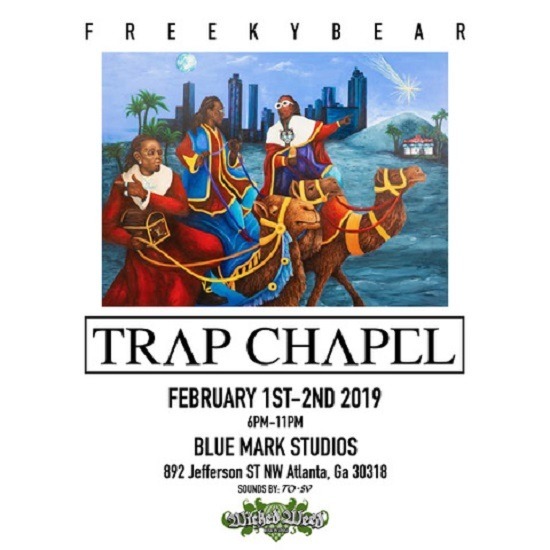 About: TRAP CHAPEL, a solo exhibition by Atlanta native, FREEKYBEAR, aka Adam Crawford will be held 2 days – Friday, February 1 & Saturday, February 2, 2019 from 6pm-11pm at Blue Mark Studios, 892 Jefferson St, Atlanta, GA 30318. The show features 20+ new paintings depicting Atlanta trap artists as iconic Renaissance masterpieces. RSVP at theartofadamcrawford.com for complimentary beverages provided by Wicked Weed for those 21+ years of age. Crawford’s art has been featured at T.I.’s Trap Music Museum, ChooseATL, Art Basel Miami, Cam Kirk Studios & Zucot Gallery. There is no cover charge or entry fee. Wicked Weed Brewing is the sponsor. Deejay TO-VS will be flying in from Los Angeles, to provide the sounds.